After two previous years of Best Picture winners with socially-conscious themes in the post-war period, 1947 was not much different. Two of the Best Picture nominees were Hollywood's first significant attempts to explore racial bigotry and prejudice and attack anti-Semitism following the horror of the Holocaust. 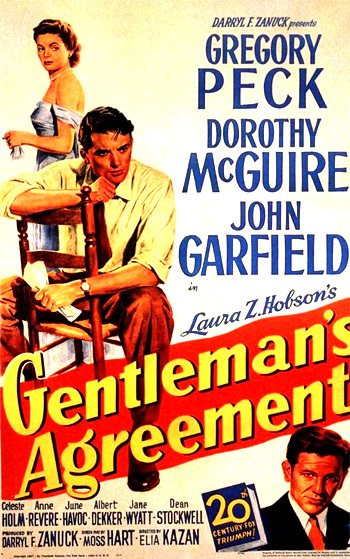 The Best Picture winner was producer Darryl F. Zanuck's Gentleman's Agreement (with a total of eight nominations and three wins - Best Picture, Best Supporting Actress, and Best Director), a serious, preachy melodramatic film by director Elia Kazan. Adapted from Laura Z. Hobson's best selling novel (initially serialized in the magazine Cosmopolitan) by Moss Hart, it was an expose of anti-Semitism through a story about a crusading, non-Jewish magazine writer who assumed a Jewish identity for six months to gather material, write a series of articles, and at first hand experience and understand discrimination and anti-Semitism. The title of the film was taken from the concept of unwritten 'gentleman's agreements' that keep religious prejudices alive in every area of life. The two lead performers in the Best Picture winner (Gregory Peck and Dorothy McGuire) lost in the Best Actor and Best Actress categories respectively, but Celeste Holm, in her third film, did win the Best Supporting Actress award (she defeated her own nominated co-star Anne Revere, who had won the same award two years earlier for National Velvet (1945)). The winner in the Best Actress award category was a big surprise and upset - Loretta Young (with her first of two career nominations - and only Oscar win) won for her role as Katrin Holstrom, a Swedish-American farm girl in Minnesota (a maid in the house of a mid-western Congressman) who ended up elected to Congress where she faces a showdown with her lover and rival Joseph Cotten in director H. C. Potter's The Farmer's Daughter (with two nominations and one win - Best Actress). Young was a respected and dependable, but minor film actress who made her first screen appearance in 1928, and had appeared on the screen 84 times by 1947 (in non-nominated roles including Capra's Platinum Blonde (1931), Zoo in Budapest (1933), Borzage's Man's Castle (1933), and The Stranger (1946)). The Oscar-winning part was given to her after Ingrid Bergman turned down the role. Competitor and long-time star Rosalind Russell (with her third of four unsuccessful career nominations) was also nominated in the category for her critically-acclaimed, award-winning role as Lavinia Mannon in the film adaptation of Eugene O'Neill's portentous Mourning Becomes Electra. Russell was generally considered the odds-on favorite, since she was also considered the probable winner in the previous year for her portrayal of the title role in Sister Kenny. The Best Supporting Actor winner was Welsh-born actor Edmund Gwenn (with his first of two career nominations - and his sole Oscar win) as the believable, plump, department store Kris Kringle - a smiling, real "Father Christmas" in Miracle on 34th Street. Instead of a Best Supporting Actor or Best Actor nomination, James Baskett received an Honorary award for his performance as happy-go-lucky Uncle Remus in Disney's Song of the South. He was the first African-American man to receive an acting award, and the first Disney actor to receive an Academy Award - although it was non-competitive. [It would be a decade before an African-American male performer would be nominated for a competitive acting award, Sidney Poitier as Best Actor for The Defiant Ones (1958).] This live action/animated musical also won an Oscar for Best Song "Zip-A-Dee-Doo-Dah," and was nominated for Best Score. The Original Screenplay nominees were a distinguished group: Ruth Gordon and Garson Kanin for A Double Life, Abraham Polonsky for the boxing tale Body and Soul, Charles Chaplin for Monsieur Verdoux (although Chaplin considered it his best film, it was a box-office flop) and the screenplay for the Italian neo-realistic classic Shoeshine by Vittorio De Sica, but the award went to pop-fiction novelist Sidney Sheldon for the weak and inferior screenplay for The Bachelor and the Bobby-Soxer. The Academy had no separate category to recognize foreign language films until 1956 when it established the Best Foreign Language Film category. 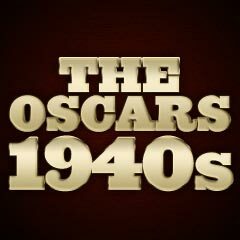 However, 1947 was the first year in which an outstanding foreign film would be honored each year by a special non-competitive statuette awarded by committee. Italy's Shoeshine was the first foreign film to receive a special Academy Award: "the high quality of this Italian-made motion picture, brought to eloquent life in a country scarred by war, is proof to the world that the creative spirit can triumph over adversity." The film also received only one unrewarded Oscar nomination, Best Original Screenplay. Entirely overlooked among the foreign film nominees this year was Jean Cocteau's lyrically imaginative version of Beauty and the Beast, La Belle et La Bête. Maybe it was a mistake to have Edmund Gwenn nominated for a supporting role - which he won - for Miracle on 34th Street. If he had been nominated for a leading role, then Richard Widmark should have won for Kiss of Death. Charlie Chaplin's Monsieur Verdoux received only one minor nomination - Best Original Screenplay, and it lost that one. Chaplin should have been nominated as Best Director and Best Actor, and supporting star Martha Raye should at least have been awarded a nomination. Black Narcissus, from the producing/directing/writing pair of Michael Powell and Emeric Pressburger won its two nominations (Best Color Cinematography and Color Art Direction/Set Decoration), but its director and star Deborah Kerr as Sister Clodagh went un-nominated. Jacques Tourneur's superbly-made pulp film noir Out Of The Past was completely ignored - the acting performances of Robert Mitchum, Kirk Douglas and Jane Greer were outstanding and unnoticed by the Academy. A number of fine films were up for awards in various categories but usually lost, including The Ghost and Mrs. Muir (for Black and White Cinematography), Green Dolphin Street (it lost for Editing, Recording, and Black and White Cinematography, but won the Special Effects Award for an earthquake), the colorful epic with Tyrone Power - Captain From Castile (for Alfred Newman's excellent score), and Otto Preminger's Forever Amber (for David Raskin's score).